Other liberals lamented that the party had lost white voters in such states as Ohio and Iowa who had supported Barack Obama, and they said Democrats needed to dial back the identity talk to win them back. U.S. Senator Kamala Harris has not officially said she is running in 2020, but she hasn’t denied it, either, and she’s showing many of the signs of someone who is preparing for a run, including campaigning for her Democratic colleagues in key races and signing a deal to write a book. The Californian ranks low in polls of the potential Democratic 2020 field, and she doesn’t have the name recognition of other contenders. (Her first name is still widely mispronounced — it’s COM-ma-la.) But betting markets have her near the top, reflecting the view among political insiders that Harris could win the Democratic nomination with a coalition of well-educated whites and blacks, the way Obama did in 2008. Harris, who went from district attorney of San Francisco to attorney general of California, was a heavy favorite in her 2016 U.S. Senate race. But once elected, she was expected to become a virtually powerless freshman senator in Hillary Clinton’s Washington. In fact, she might have been only the second most important person in Washington from her family, since her younger sister, Maya, was a top Clinton policy adviser on the campaign and in line for a senior White House job. But Clinton’s loss created an opportunity for Harris. The Democrats had the normal leadership vacuum of a party without control of the White House but also a specific void of people who were well-versed in immigration issues and were willing to take the leftward stances on them that the party base wanted as Trump tried to push U.S. immigration policy right. Meanwhile, Biden and Sanders were not natural figures to defend Planned Parenthood when, as part of the repeal of Obamacare, the GOP sought to bar patients from using federal funds at the nonprofit’s clinics. African-American activists went from being deeply connected to the White House to basically shut out of it, as Trump had few blacks in his Cabinet or in top administration posts. And, electorally, while Sanders or Massachusetts U.S. Senator Elizabeth Warren were obvious potential presidential candidates for the populist wing of the party that backed the Vermont senator in the 2016 Democratic primaries, the coalition of minorities and more establishment-oriented Democrats1 who had backed Clinton didn’t necessarily have an obvious standard-bearer, particularly with the uncertainty over Biden’s status as a candidate in 2020. While veteran party leaders like Biden may have wanted the party to move to the center on identity issues, Democratic voters had moved decidedly to the left, a process that was happening under Obama but may be accelerating under Trump. 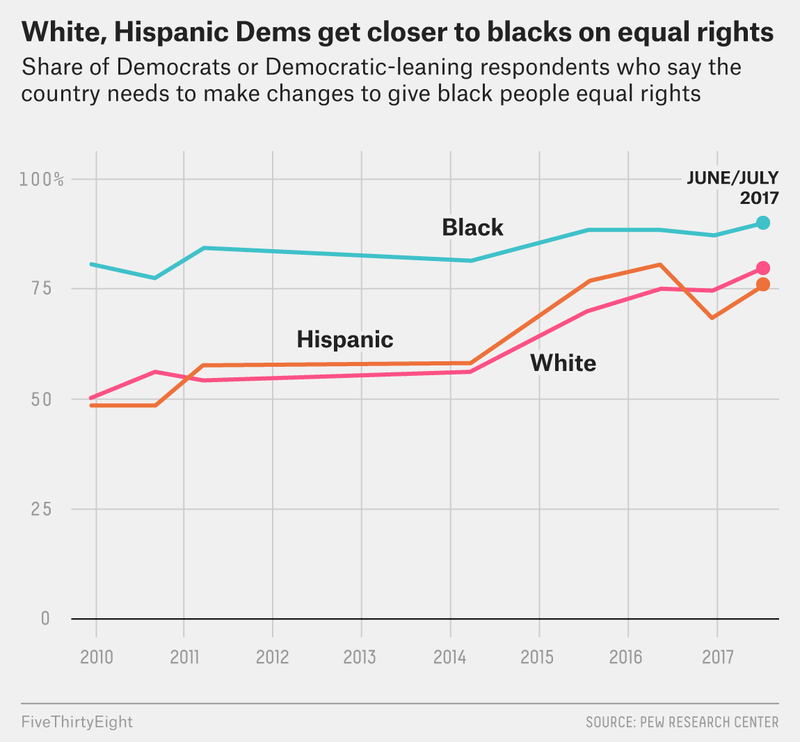 For example, a rising number of Democrats say that racial discrimination is the main factor holding blacks back in American society, that immigration is good for America and that the country would be better off if more women were in office. “The Democrats are the party of racial diversity, of gender equality — and there’s no going back from that,” said Lee Drutman, a political scientist at the think tank New America, who has written extensively about the growing cultural divide between the parties. Harris has seized the opportunity. From attending the annual civil rights march in Selma to pushing legislation that would get rid of bail systems that rely on people putting up cash to be released from jail, she has seemed to try to lead on issues that disproportionately affect black Americans and to position herself as their potential presidential candidate. She was one of the earliest critics on Capitol Hill of the Trump administration’s aggressive immigration policies, and her push for a government shutdown over the Deferred Action for Childhood Arrivals program delighted party activists(even if the strategy ultimately failed). Harris was among the first Senate Democrats to call for Minnesota’s Al Franken to resign amid allegations that he groped several women, and she has been a strong defender of Planned Parenthood. Well, yes. But here’s the big difference: Obama didn’t emerge as a presidential candidate by highlighting his strong stands on these divisive, complicated cultural issues, as Harris is attempting to do. In fact, his rise was in large part because he implied that America was not as divided on those issues as it seemed — and that those divides were diminishing. Whatever the reality of such statements, the political strategy behind them made sense: It’s hard to imagine that America a decade ago would have embraced a nonwhite politician who wasn’t downplaying cultural divides and emphasizing unity. Back then, someone regularly talking about his or her ancestors being kidnapped and enslaved probably had no chance at being elected president. But 2018 is much different than 2004 or 2008 in terms of the national debate on identity issues. For example, compared with a decade ago, a much higher percentage of Americans, particularly Democrats, see racism as a major problem. Over the past decade, Americans went through the birther movement, shootings of African-Americans by police captured on video, Black Lives Matter protests, Trump’s racial and at times racist rhetoric and Clinton’s “basket of deplorables” remark. And it’s not just race — think about #MeToo, the legalization of gay marriage and new debates on the rights of people who are transgender.